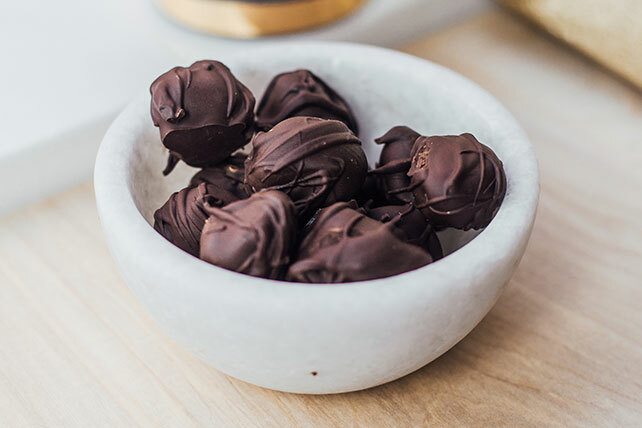 It's hard to believe that these elegant chocolate truffles are made with just three ingredients. Even harder to believe: how simple they are to make. Chop 6 oz. of the chocolate; set aside. Bring cream to boil in medium saucepan on medium heat; remove from heat. Add chopped chocolate and butter; stir until chocolate is completely melted. Cover and freeze 1 to 2 hours or until firm enough to handle. Use teaspoon to scoop chocolate mixture into 24 balls, each about 1 inch in diameter; place on wax paper-covered baking sheet. Freeze 20 min. Chop remaining 6 oz. chocolate; place in microwaveable bowl. Microwave on HIGH 1-1/2 min. or until chocolate is partially melted; stir until chocolate is completely melted. Carefully dip each ball in chocolate, then return to baking sheet. Drizzle with any remaining chocolate. Refrigerate 30 min. or until firm. Chocolate truffles make a sweet treat that is perfect for gift giving or for serving on a special occasion. Omit 6 oz. of the chocolate. Prepare and freeze truffles as directed, then roll in powdered sugar or cocoa powder instead of dipping in the melted chocolate. Add 2 Tbsp. orange-flavored liqueur to the warm cream with the chopped chocolate and butter.